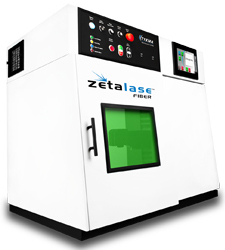 The Zetalase™ Fiber Laser Marking System offers more value-added features than any other system on the market. Air-cooled and maintenance-free, this powerful, full sized MOPA fiber laser system operates on 115-220VAC for low power consumption. Backed by a three year warranty, Zetalase™ ships fully assembled. 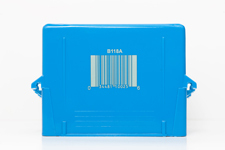 It’s ideal for single or multiple part marking on all metals; carbide, painted or anodized surfaces and most plastics. 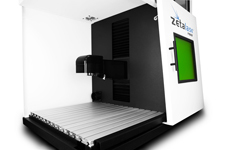 In addition to the built-in PC, Touch Screen Interface and Power Focal Height Adjustment, Zetalase™ has an increased work platform and 180° dual access door for large part handling. 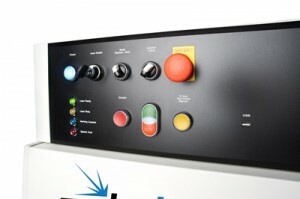 Available options include programmable focal height and a rotary device for 360° marking. *Max. part height decreases with 254mm lens upgrades. 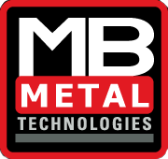 Consult MB Metal Technologies for details. CAD files are available. Please contact us for details.